So here’s one last look at dressing up a Summer maxi dress and taking it straight into Fall. 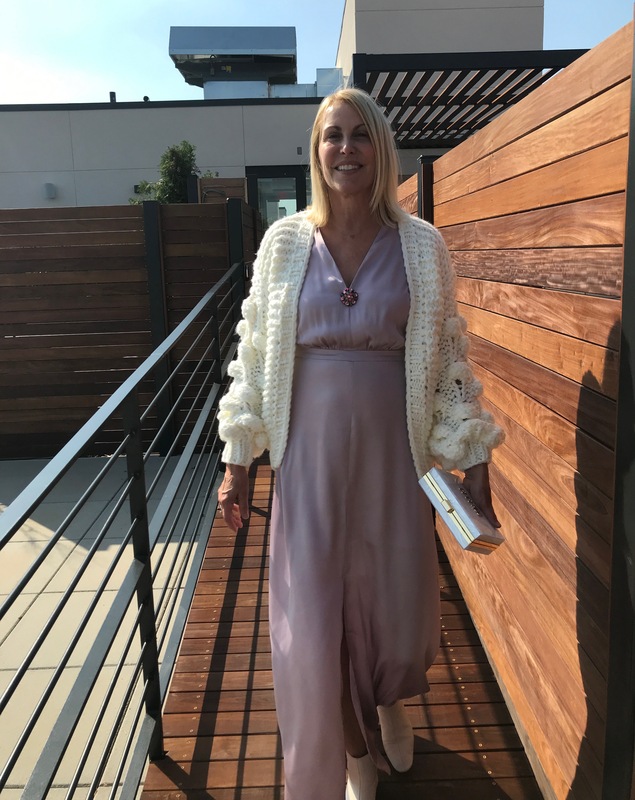 Confession: I bought this lovely violet maxi to wear to a wedding but decided to go with a something else when the weather turned cool (and I hadn’t unpacked this sweater or booties!). 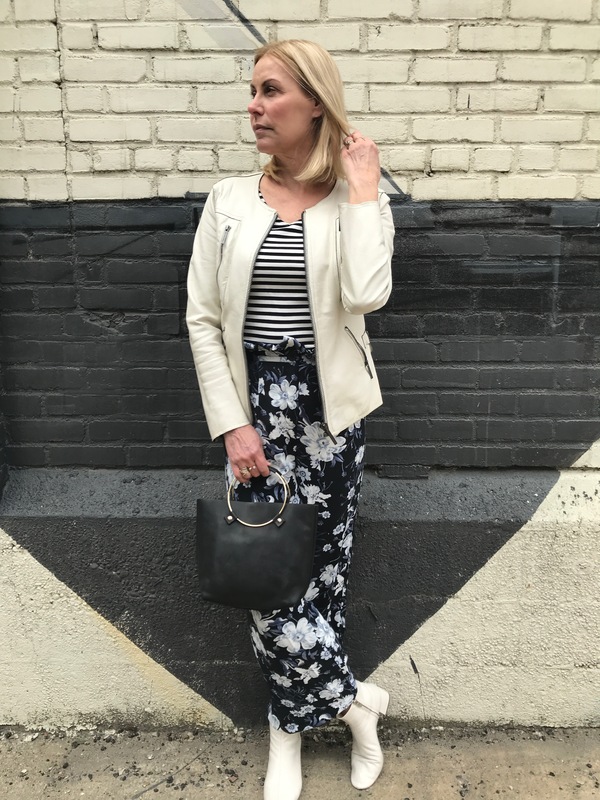 If you have an early Fall wedding, big party or even special date night planned, I think this outfit would be perfect. And, it combines key fashion trends that show no sign of cooling off — the midi or maxi dress, violet/lavender/lilac, a chunky knit sweater and white booties. So Spring may have officially arrived, but it’s nowhere in sight up here in JC. In spite of that, I’ve decided to take a wishful approach to dressing in the days ahead. When temps rise into the 50s, I’m going to break out whatever lighter layers I can. First on the list, a moto jacket. In white leather, no less. This jacket is such a classic you could collect it in many colors, textures and silhouettes. Note to self, now that shopping hiatus is over look for a new black one. Or perhaps a moto jacket in an unexpected shade or texture? Neutral? Bright? What would you pick? “Summer Color” used to mean slathering on baby oil and getting your tan on. Not anymore. These days the only thing I’m slathering on is sunscreen. So I’ve been on the hunt for other ways to color my days (and nights). I actually saw this adorable tee dress on Cathy Williamson’s The Middle Page. 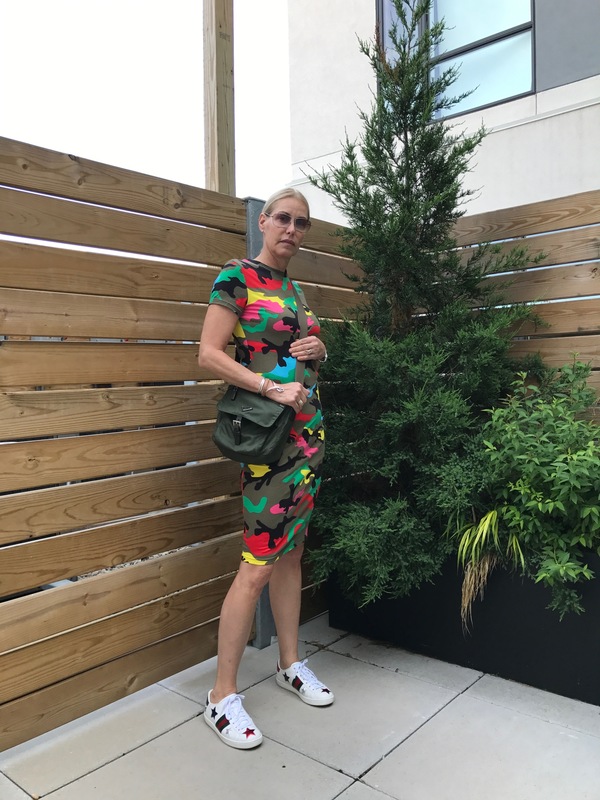 She is a super successful, 50-something Dallas Fashion Blogger. And like me, when she wears a “tee” it’s usually paired with jeans. But this dress was too cute to pass up. And too cheap! As in $13!! I promise it looks pretty great in person. As proof, I previewed it on our walking tour around Savannah. Chris could not believe how many people complimented me on it.